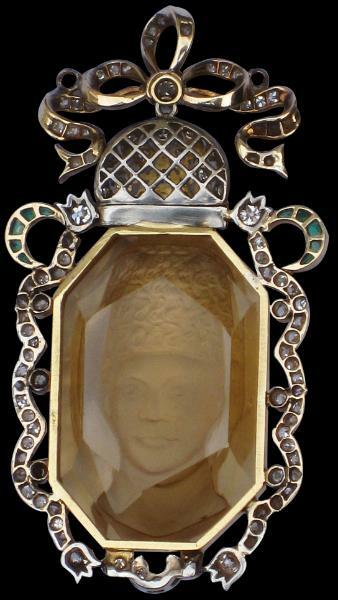 This bow pendant, which can be worn either suspended from a chain, or on a ribbon, shows a large central image of a young Muslim prince, in slight profile, in very high relief hand cut and tooled from a single piece of citrine. This is set in gold and platinum surrounded by a ribbon of old-cut diamonds with flower-bud ends with a crescent in diamonds beneath the image and prominent crescents in emeralds to either side above. Over the image is a prominent crown, with the lot suspended from a tied ribbon set with diamonds and with on large central diamond. The setting is most probably English or French, commissioned from a leading jeweller by a royal house or similar, or was made locally. karakul, a woollen astrakhan hat, favoured by members of the Qajar nobility. 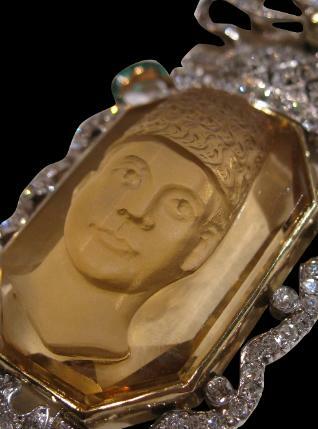 The citrine has been carefully carved to show clearly that the hat is a karakul, with its woollen texture. 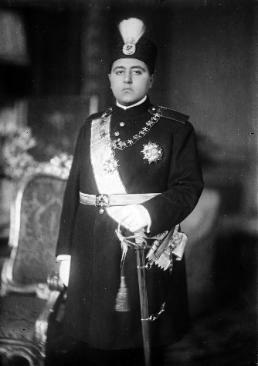 The use of a crown is particularly Persian among the Muslim sultanates and kharnates: monarchical traditions were so strong in Persia that the Qajar ruler had a crown and a coronation, unlike other Muslim rulers. 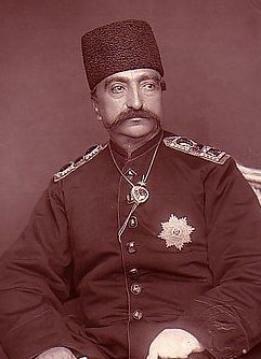 Indeed, the Qajar court had many elements more in keeping with European courts than the rival Ottoman court. Courtiers at the Qajar court were relatively at ease and less subservient than was the case with the Ottoman court, which in any event was far less of a closed world with the Qajar shah being more accessible and visible to the general population. 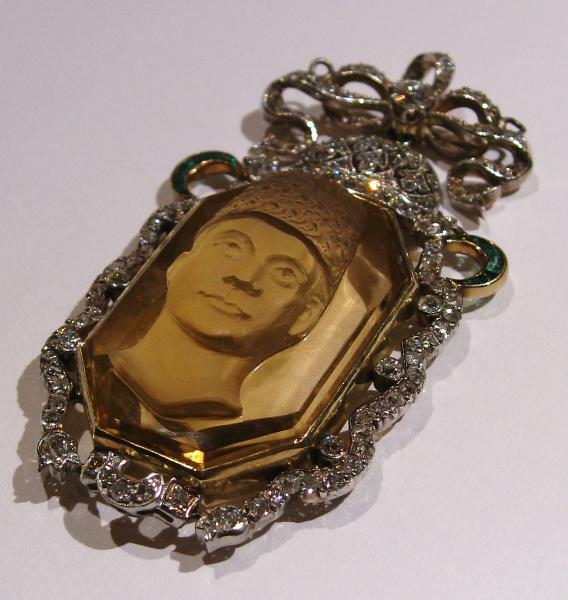 Portraits of senior members of the Qajar royal family incorporated into jewellery to be worn had a long tradition in Qajar Persia. 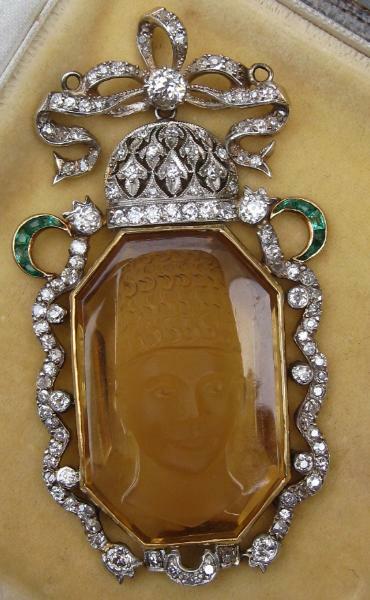 Early on the practice developed whereby members of the royal family wore an image of the previous shah on their breast, or in the case of the shah, of his father. In the first half of the nineteenth century an Order of the Imperial Effigy was created which combined this tradition with the European practice of orders and decorations. 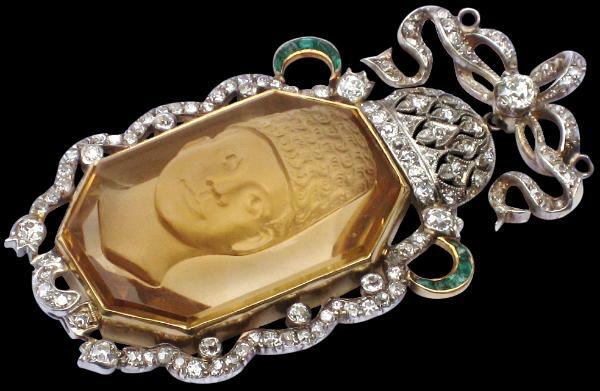 This Order followed the form of this pendant in that both were oval in shape and show a royal image, surrounded by diamonds that is topped with a crown. 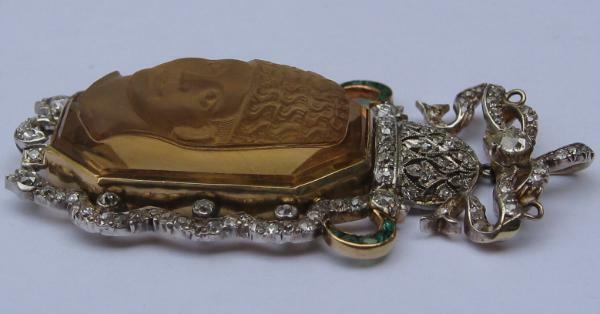 The Order however has an image that is either hand-painted or in later years, a small photograph, and not carved as is the case with this pendant. Jewelled portraits were also presented by the ruler as a mark of royal favour, a practice in common with the rulers of Ottoman Turkey. Nasir al-Din Shah (who reigned 1848-1896) loved jewels and wore copious large emeralds, diamonds, pearls and rubies on state occasions as pendants, brooches, and so on. 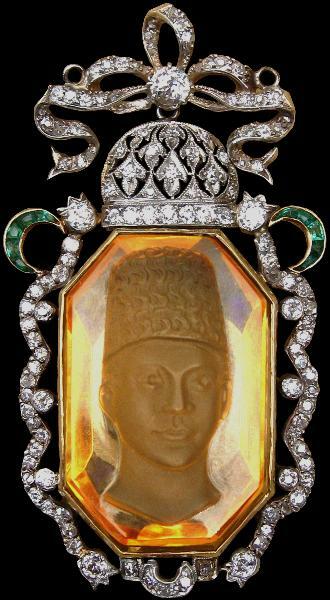 The Ottoman sultan Abdul Aziz made fun of the Shah’s love of jewels by presenting him with a set of diamond wooden platform shoes to be worn in the bath-house. Overall, this is an exceptional, extravagant piece of history in superb condition. Heaven on Earth: Art from Islamic Lands, Prestel, 2004.